A few months ago, a first-time author emailed me to see if I would review a young-adult book that she is releasing in November. I told her I would read it, and see what I thought. 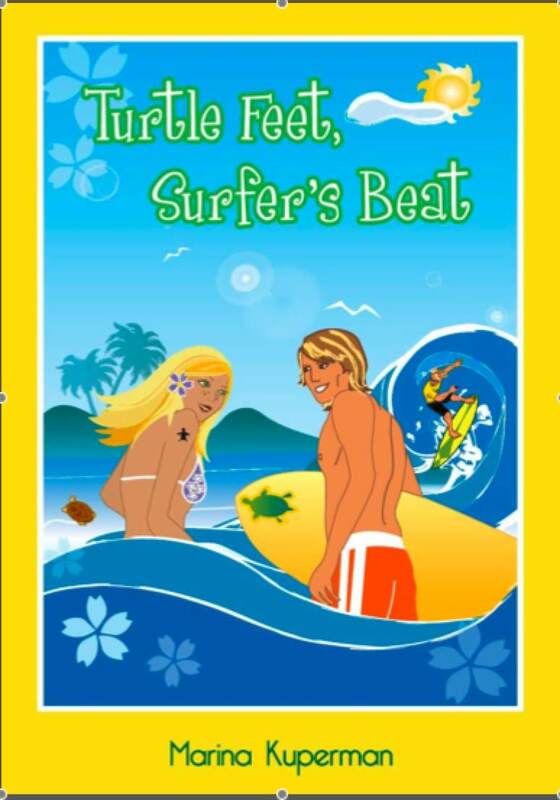 Turtle Feet, Surfer’s Beat is the story of a 16 year-old girl named Penelope, who is forced (?) to leave her home in suburban New York to live in Costa Rica for a month. Her father, a noted nature photographer, is being sent on assignment to cover the efforts to protect the hatching grounds of the leatherback turtle. Her mother, who is on the verge of divorcing her dad for his constant travel, insists that the whole family go along for the ride. Right before the trip, her high school boyfriend, the quarterback of the football team, breaks up with her because he can’t handle a long-distance relationship. Penelope and her younger brother Samuel, are ‘volunteered’ to help with the hatchery- protection efforts, so that their parents can have some time alone to repair their relationship. While living at a nature camp, Penelope meets and falls in love with a local surfer boy. Kendall is a native New Jerseyan whose parents have taken an early retirement in Costa Rica, where they run a small surf shop. There’s a girl-gets-boy, girl-loses-boy, girl-gets-boy-back kind of thing going. In addition, the parents get back together and it all ends happily for the turtles too. I have to say that I don’t really know any girls who are the right age to read this book, so I’m a little ill-prepared to recommend it for a specific age group. The main character does lose her virginity in a not-terribly-graphic scene, so that pegs the demographic as older than either of my kids. I should also say that I was a little pre-disposed to dislike the book, because instead of sending me a review copy, the author sent me a PDF. There’s nothing like having to burn out a whole printer cartridge to really put one in the right mood for reviewing. I think I overcame it, though. Overall, I could tell that Ms. Kuperman is very committed to saving turtles. The parts of the book that involved turtle facts and turtle rescue were well-researched and compelling. The rest of it? I was kind of meh about. The characters are not drawn particularly deeply–including the main character, who is extremely shallow. The parents are almost paper-thin, particularly the father. And the love interest seems to be based purely on a high school girl’s fantasy. The crisis of the romantic sub-plot is contrived (another girl tells Kendall that she saw Penelope kissing another boy–he knows it’s not true, but goes along with it because his feelings for Penelope are “too intense”), and the resolution is somewhat unbelievable (although perhaps I’m forgetting what it’s like to be 16 and in love). I give Kuperman props for writing a book with a social message. But the surfer speak left me kind of cold. It’s possible that for a book of its genre, this is average–I haven’t read any of those Sweet Valley High books in a while, and my sense is that there’s a similar demographic targeted here. But this book is not going to be giving you answers about any of life’s big questions. October 28, 2007. books for kids, free stuff can be good. 1 comment. CamiKaos, for her great entry on the pirate rock concert. I have to say, half of my very subjective judging of this contest is based on the fact that, seriously? Pirate rock concert? How cool is that? I’ve gotta move to Portland. And for the second place, I’m going with Katlyn Valerio, because most everyone else blogged/commented about books, and she talked about trampolines. How can I choose between book lovers? Katlyn, Cami, send me your addresses via email and I’ll get your packages in the mail. And on a related (to trampolines) note, check out this link. August 9, 2007. books for grown-ups, books for kids, free stuff can be good. 4 comments. So after all of my fretting about finding an English-language copy of Harry Potter & the Deathly Hallows, it turned out that there were oodles of them right there in the airport. And then, when we got to Provence, it turned out that my MIL had bought us a copy too, because landisdad had told her we were going to be looking for it. And she thought it was for the Bee. A little embarrassed about that one, frankly. So I find myself with not one, but two copies of the world’s most popular* book. With the British cover. And I thought, “hey, people who read my blog like books! Some of them even collect Harry Potter books with covers from different countries!” My efforts to find a French version for Alexandra were in vain, but I can still send someone a little Harry love. So I’ve decided to have a contest. Being as I got this copy through a misunderstanding about my love of kid-lit, I’ve decided to set up a blogging contest based on adult interest in kid-related hobbies. If you want to win my extra British copy of Harry Potter 7, all you need to do is write a blog post (or a comment here, if you don’t have a blog) about a kid-type thing that you enjoy more than your kids–or enjoy more than most adults do, because of your kids. Link back to this post so I can find yours, and do it by midnight on August 8. If you’re not a parent, you’re free to write about some kid-related thing that you enjoy more than other non-kids. If you don’t like kid things, you’re probably not interested in winning this contest, so I’m not going to bother making up something for you to do. First prize is the book. Second prize is a couple of random French souvenirs. Third prize? You’re fired. August 1, 2007. books for grown-ups, books for kids, free stuff can be good. 12 comments. I got an invite a while back to review a new photo-sharing service, Greetingflix.com. Disclaimer–in exchange for a review, they upgraded me to a Pro account for free, a total value of $19.95 per year. I confess that, while I do share photos online fairly frequently, it never occurred to me to make little slide shows of my pictures, and if you’re into that kind of thing, it seems like a nice little service. I did try it out in the free version before the Pro upgrade went through, and it seemed a little buggy. In fact, I couldn’t upload my pictures at all, and ended up giving up and not coming back to it for a week or so. Once I was on the Pro account, the uploads were no problem, and the account size is a full 1 GB of storage, which is plenty for me. I’m not really sure how much I will use this, though. While my love of stationery is fairly well documented on this site, I tend to buy blank cards and stationery, rather than going the Hallmark route. I’m picky about the kinds of sentiments that I express, and I found this site limiting, because I couldn’t modify the text of the flix. You do have the ability to add a statement at the end, which I guess I would do if I were sending one as a greeting card, but I am not crazy about the idea of using a template that has someone else’s words in it. I’d post the greeting that I made, but I can’t figure out how to do it. They have code to post onto a myspace page or blog, but it doesn’t seem to be working in wordpress. If you’re interested in seeing it, email me or leave a comment, and I’ll send it to you. Anyway, if you’re looking for a fairly simple way to combine your own photos with music, text and some nice animation, give greetingflix a whirl. May 24, 2007. free stuff can be good. 2 comments. I get some interesting offers via email to my blog (no, not that kind!). Unlike my friend Metrodad, no one has ever offered to send me a free portable DVD player to review. But a few months ago, an intern from BenBella Books contacted me to see if they could send me a review copy of This is Chick Lit. I’ve never been one to say no to free books, so I told him I would take the book, but that I wouldn’t guarantee that I’d review it. I have to say, that as far as burning political issues of the day go, this is not one of my more pressing concerns. I can appreciate it that women get upset when they feel like other women are denigrating their work–I mean, the whole Mommy wars thing is right up this same alley. Or maybe it’s more comparable to the mommybloggers controversy that’s occurred at Blogher–where some women got upset that there are mommybloggers in the world, taking away from the seriousness of their own blogs. It came last week, and I read it over the weekend. For the most part, the stories that I liked were the ones that didn’t try to fit in an entire novel in ten pages. The art of story writing is different from the art of novel writing, but I’m not sure every contributor to this thing got the memo. I’m not the world’s biggest chick lit fan, but neither am I the smallest. I’ve read all of Jennifer Weiner’s books, I read the Bridget Jones novels, The Devil Wears Prada, The Nanny Diaries, all that stuff. But just like I don’t love every mommyblogger’s writing, I didn’t love every story in this collection. There were some that I liked, but none of them knocked my socks off. If you’re looking for a light beach read, check this one out. August 30, 2006. books for grown-ups, free stuff can be good. 2 comments.